The Critical Areas Ordinances (CAOs) are a requirement of the Growth Management Act (GMA). Unknown to many is the fact that the oversight agency for the GMA is the Department of Commerce, not the Department of Ecology. The GMA requires that Commerce consult with Ecology on critical areas. However, Ecology has no authority, under the GMA, to involve itself at the local level. Ecology's local participation occurs only with the tolerance, permission, or invitation of our local government. According to independent analysis of the County's critical areas maps, critical areas will affect 50% of parcels covering 78% of the area of the county -- even before buffers are added. Technically, the critical aquifer recharge area (CARA) map affected 100% of parcels, but the land-use restrictions of that particular CAO were slight. By contrast, the effects of the upcoming CAOs will have onerous restrictions for affected citizens. 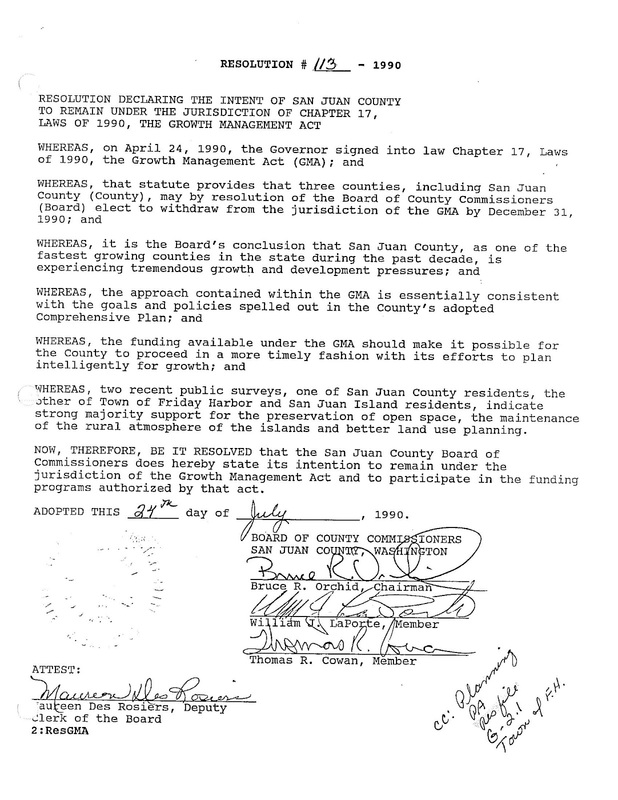 When the GMA was enacted, San Juan County was not required to fully participate (fully plan, as it is called). However, our County Commissioners at the time (Cowan, LaPorte, and Orchid) opted in. In all, 29 of the 39 counties in Washington were eventually required to fully plan. While the CAOs are required of all counties, whether they fully plan or not, the CAOs of the ten counties who do not fully plan cannot have their CAOs appealed before the Growth Management Hearings Board (GMHB). That is an often-used legal threat made by Ecology and the Friends of the San Juans: that if the Council is not appropriately strict, they will be challenged before the GMHB. The County has a sensitive areas ordinance, wetlands protections, and buffers already on the books. We voluntarily instituted shoreline setbacks for aesthetic reasons many years ago. We are required under the GMA to review, and if needed, revise the policies and development regulations related to critical areas. The County Council has forgone review and gone straight to revise. The County was required to adopt Best Available Science (BAS) as part of its CAO revision process. There is no evidence within the BAS of a compelling general environmental problem here. The Friends of the San Juans often bring up data related to pyrethrins gathered by KWIAHT, but this data fails to meet state standards for credible data, a requirement of the Clean Water Act, and cannot be considered scientifically valid. Moreover, the County's wetland consultant determined that the median rating for suspected wetlands in the County is an 8 on a scale of 1 to 10, with no statistically significant difference between the ratings of "wetlands" on developed parcels versus undeveloped parcels. Our County has even been turned down for grants from EPA because our water is reportedly too clean. The Council has refused to identify the problem(s) that are supposedly being addressed by the revised CAO. Individual Council members sometimes say our late revisions to the CAOs have cost us millions of dollars in state funding and that they must now face the tough choices that previous Councils have dodged. However, there is no basis for these statements. The law says that if we fail to comply with the GMA, the GMHB may recommend to the Governor that sanctions be imposed. 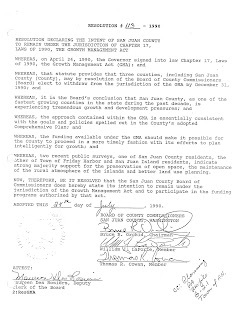 San Juan County has never been sanctioned, and the imposition of sanctions is at the Governor's discretion, with or without a GMHB recommendation.